Most of the publicity materials I make are A3 or A4 posters that also work as A5 flyers, and as “web-flyers”. But sometimes a leaflet or flyer is required, separate or instead of a poster. A poster can reach a lot of people if it is displayed in a good place. But a flyer or leaflet can be handed to people, left in small stacks in useful places and can be taken home by folks and stuck on fridges / notice-boards / windows, etc. 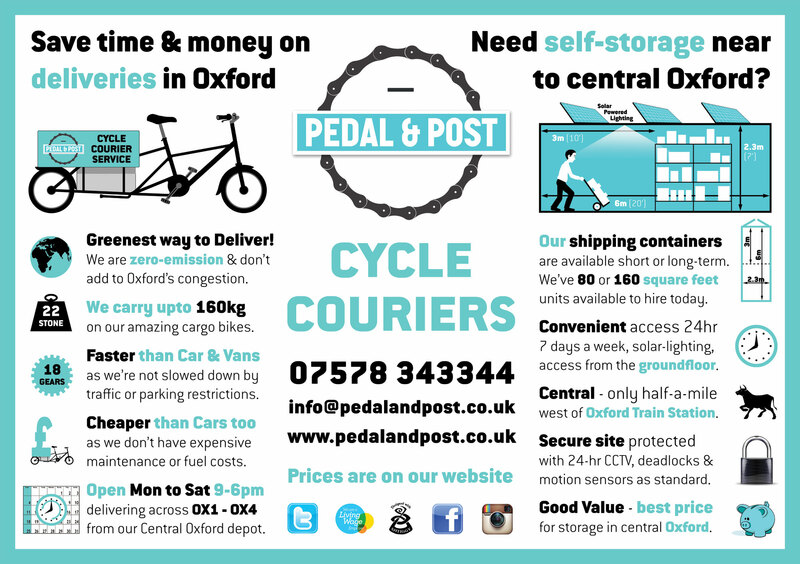 A simple 2016 flyer / postcard for one of my favourite local businesses, Pedal and Post use beautiful cargo bikes (8-freights) to move goods across Oxford, and a bit beyond. This often removes delivery trucks and vans from our congested roads, and reduces pollution. 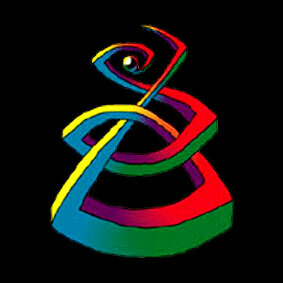 They also provides healthy, fun and fairly-waged employment to a small army of young people. Bizarrely, this design was never used. I think it’s one of my best designs – combining engaging graphics with clear succinct text. I hope Pedal & Post thrive! 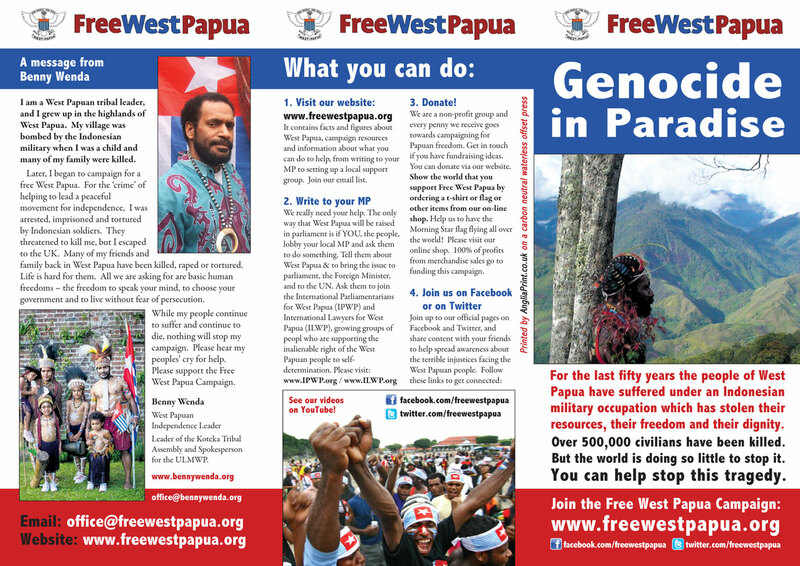 Outer spread of the updated (2015) leaflet for the Free West Papua Campaign (FWPC). This courageous and determined campaign has worked from Oxford for the last ten years. It now has offices in Australia, Holland and elsewhere, and has solidarity campaign groups all over the world. Please visit their very clear website for more information and to find out what we can do to help the people of West Papua. Download a small version of the whole leaflet to get a good introduction here. 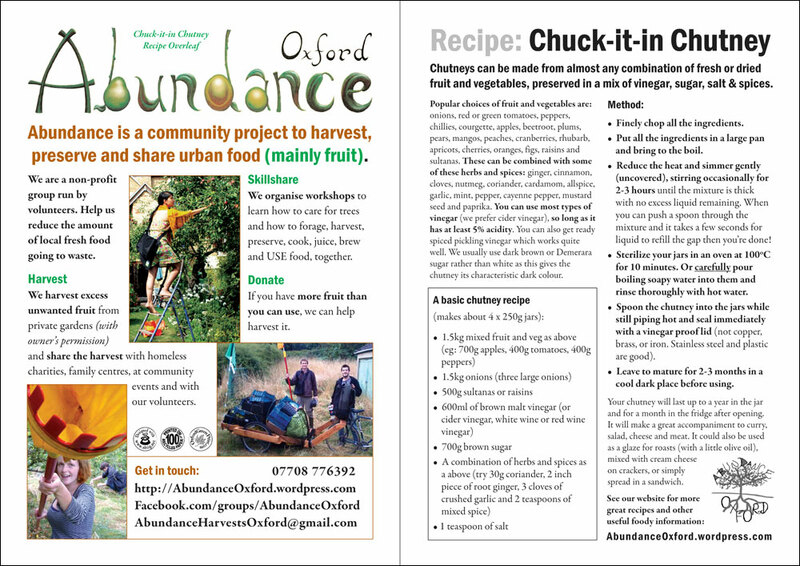 In these times of so-called ‘austerity’ it’s great to be working with a group called “Abundance“! This A5 flyer from autumn 2013 explains clearly what they do. 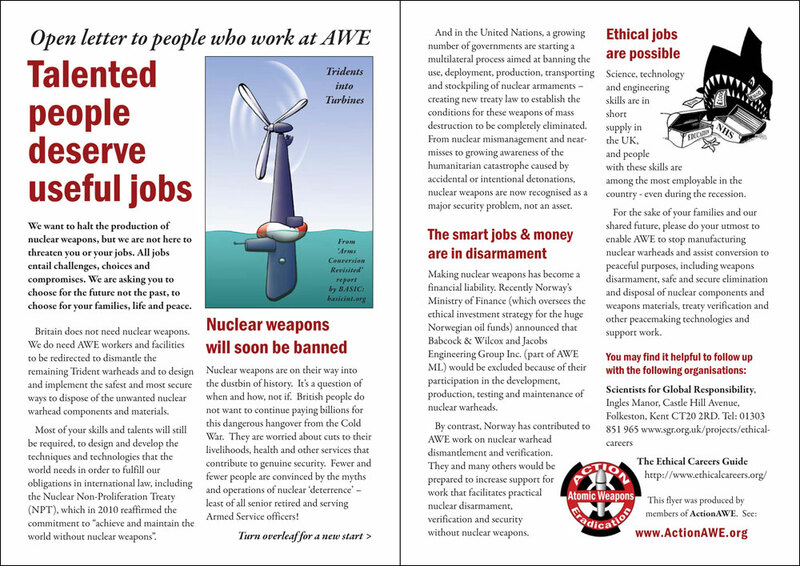 This A5 flyer is from 2013 and was distributed outside the gates of various nuclear weapons factories by the determined folks from ActionAWE. 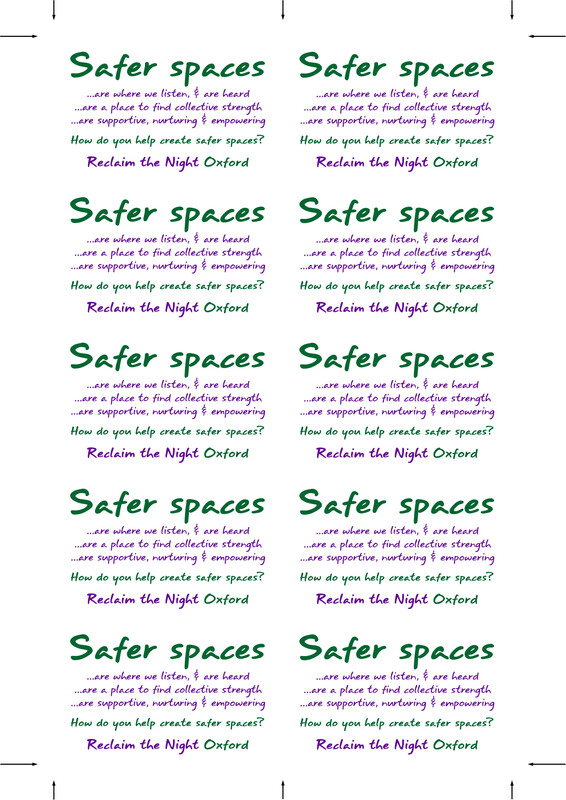 A pair of small cards from 2013 for the Oxford chapter of Reclaim the Night. 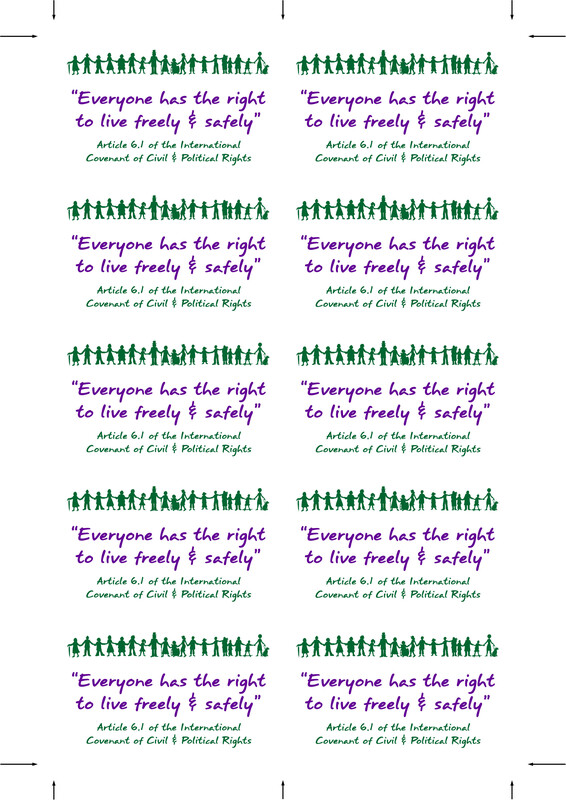 These cards are in the suffragette colours and are designed to fit into your purse or wallet for easy and widespread distribution. 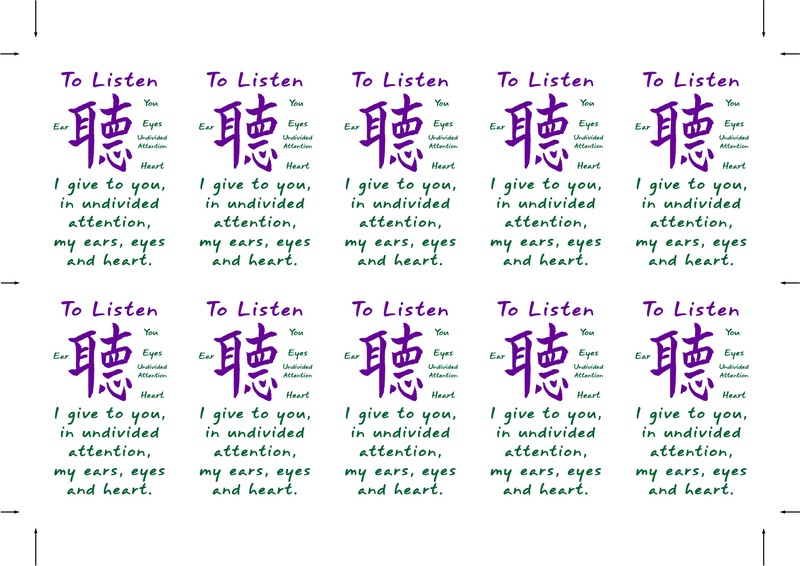 If you would like to print some, please download these high-quality A4 JPGs that have ten cards on each page. The ‘Safe Spaces card’ is here: FRONT and BAcK; and the ‘Active Listening’ cards are here: FRONT and BACK. These files are nearly 1Mb in size each as they are print-quality. 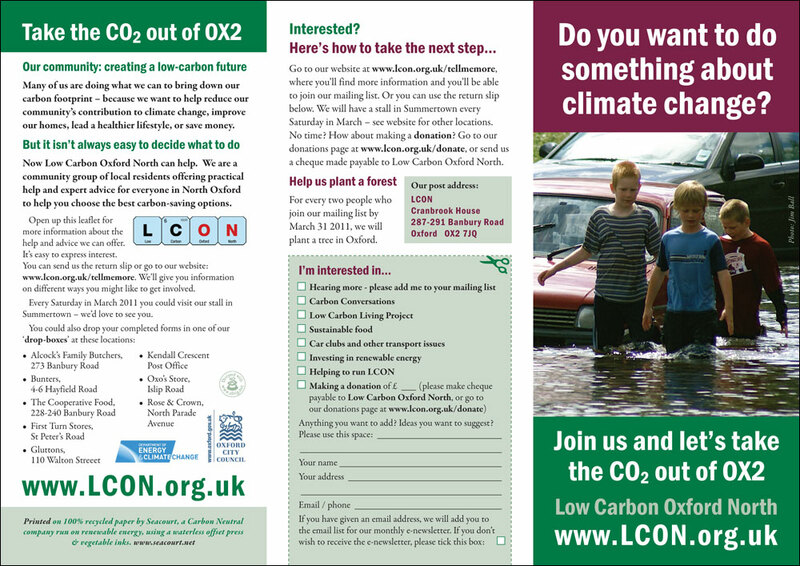 An A5 flyer from 2013 designed for the folks at Low Carbon Oxford North. 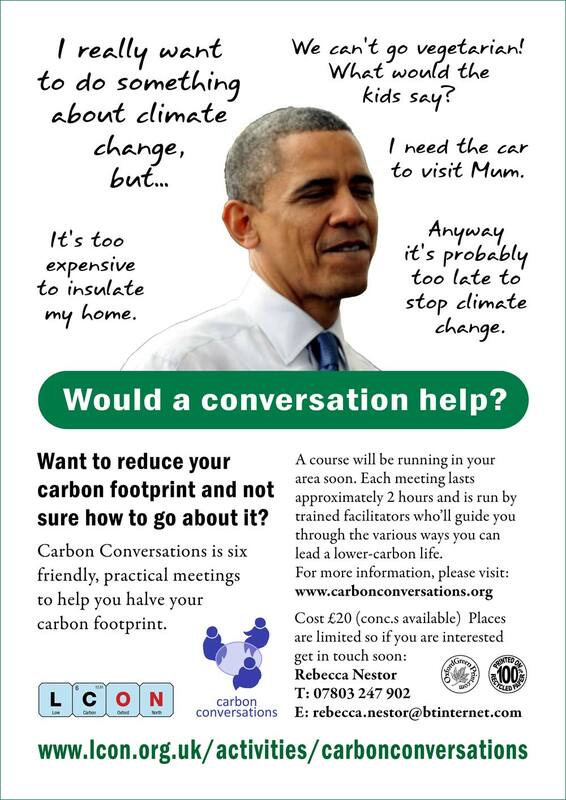 The Carbon Conversations project is spreading across the UK and seems to be a good way to get people sharing ideas and strategies on sustainable living. 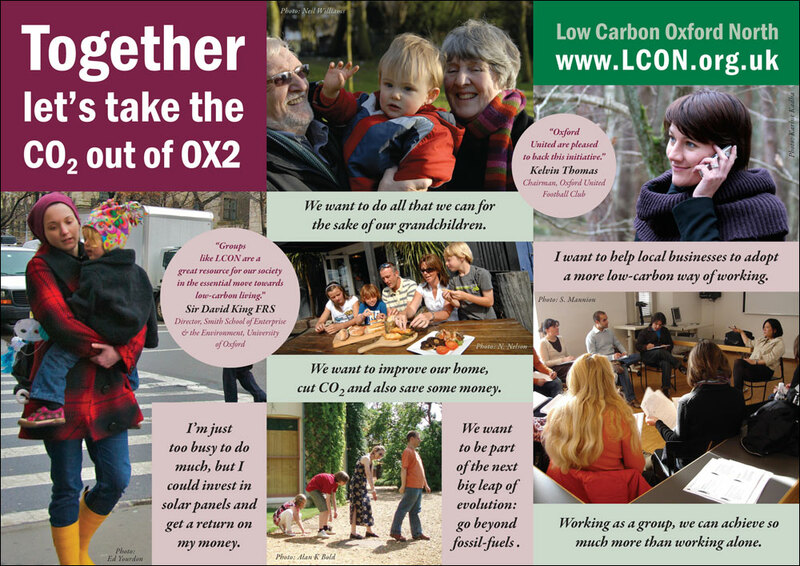 A 2011 leaflet for Low Carbon Oxford North. Above is the outer spread and below is the inner spread. The “OX2” referred to in the title is the first part of the post-code for the area that LCON operates in. The leaflet also opens out to reveal an A3 info-poster with lots more information and enticing photos. Here is a PDF of the whole thing. A DVD-sleeve design from 2011 for a great short film about non-violent direct action for Turning the Tide. A folded A4 card-leaflet from 2010 for CAAT (Campaign Against the Arms Trade) that I really enjoyed making as it quite sucessfully combined graphics and photos to look a lot like a noticeboard. In 2012 CAAT won the Right Livelihood award, which is like an ‘alternative Nobel prize’! 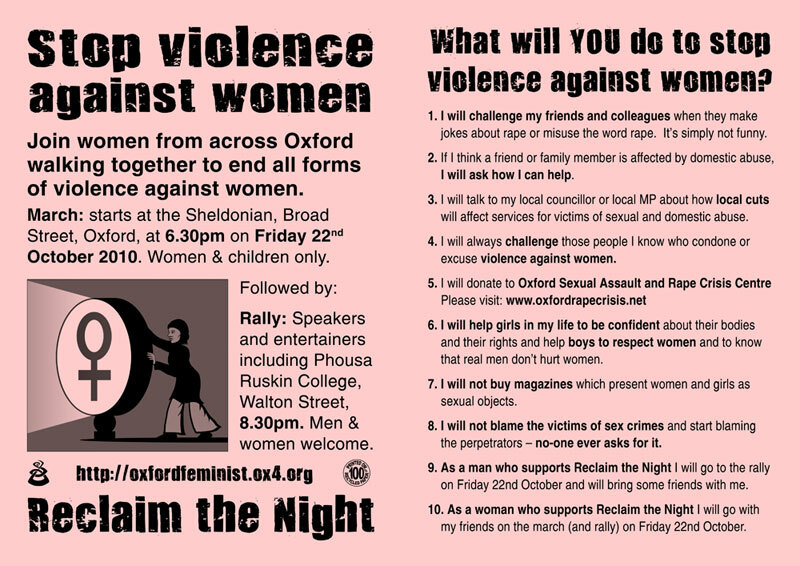 A simple but powerful A5 flyer from 2010 for Reclaim the Night (Oxford). 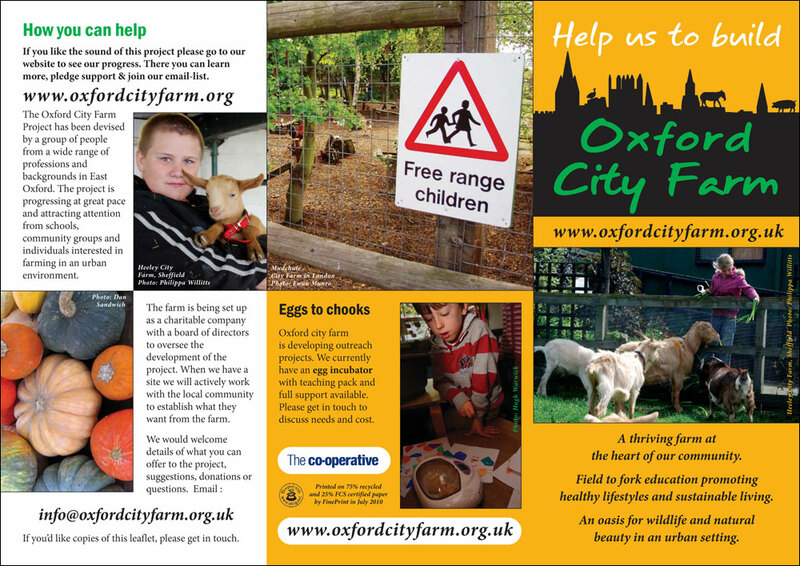 A 2010 A4 N-fold leaflet for the Oxford City Farm project. This exciting idea has been discussed and planned at monthly meetings for several years. The local council and a local land-owner do not seem to be helping much, yet. 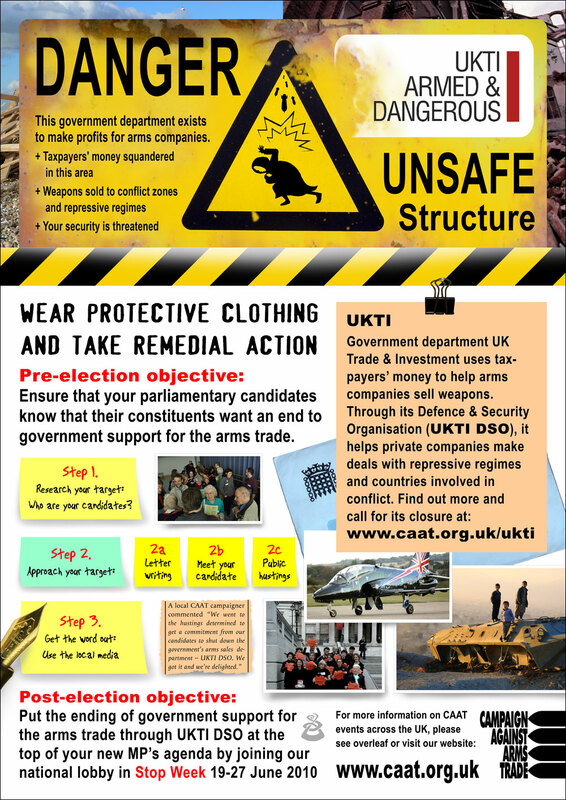 A 4-page A5 flyer from 2009 for the folks at CAAT (Campaign Against the Arms Trade) to launch a campaign against DSEi – europe’s largest arms-trade fair, which is held every two years in London. Click on the image to see a larger version that lets you read the text if you want. 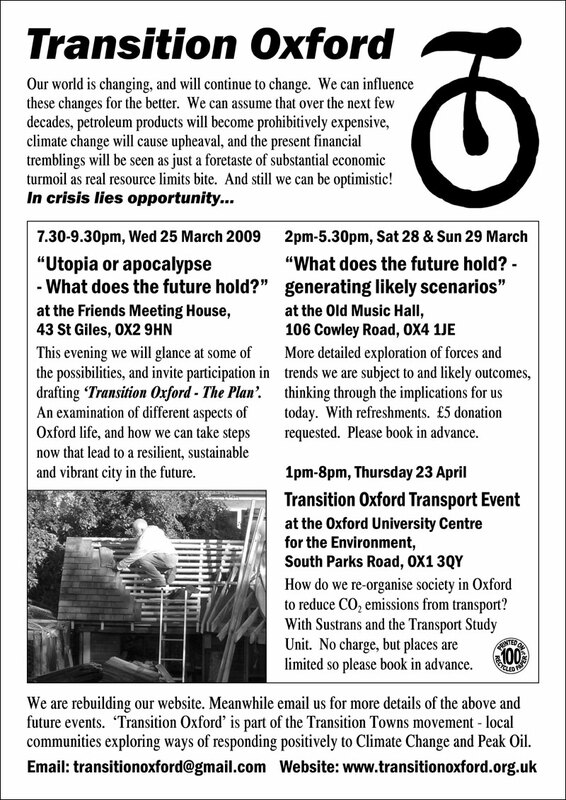 An A5 flyer from 2009 for Transition Oxford, a group that sadly disintegrated, despite the excellent and inspiring words in this flyer. 😉 The Transition Towns movement started in Kinsale, Southern Ireland, and then spread to Totnes and then on to every corner of Britain. It is making a big impact in some ares, and I think it is reaching other parts of the world, especially Canada. 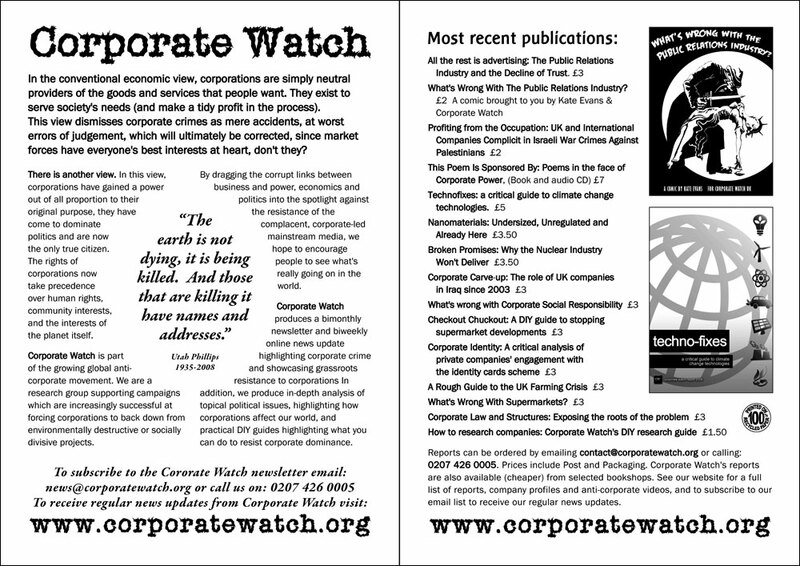 Simple A5 flyer for Corporate Watch (UK) from 2009 with a handy list of many of their best reports and briefings on the reverse page. They’ve done a lot more since then! 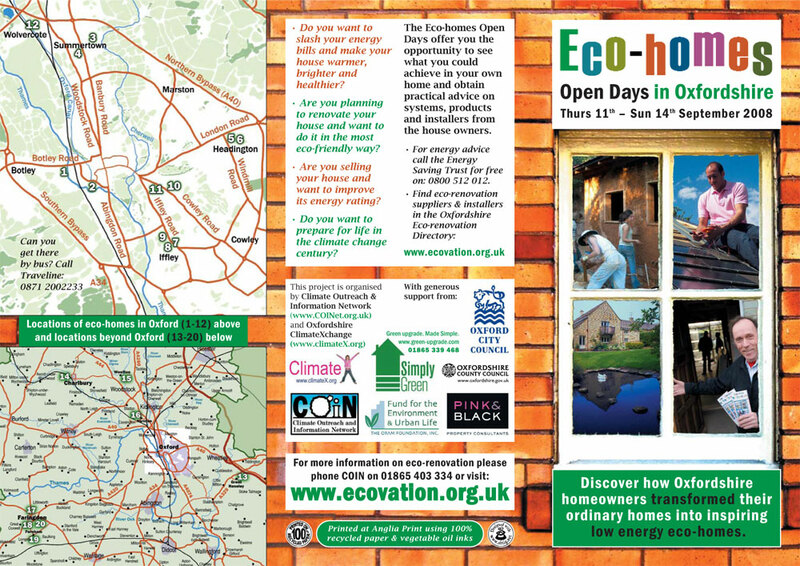 Leaflet from 2008 for the Eco-Homes Open-Days organised by Climate X (a project of Oxford University’s Environmental Change Institute) and COIN. The inside spread of this leaflet had a small photo and description of each of these ‘trail-blazing’ eco-homes. Twenty homes were open to the public for guided tours during a 4-day period, allowing hundreds of people to visit and discover ways to make their own homes more energy-efficient, saving energy and money. I think the idea first came from Brighton and has been repeated in many towns. The project website Ecovation is still on-line and features many case-studies and useful ideas and links. Leaflet for the courageous folks at the Free West Papua Campaign. Download a PDF of it here. We first made this N-fold leaflet in 2007, and update and re-print it each year or two. 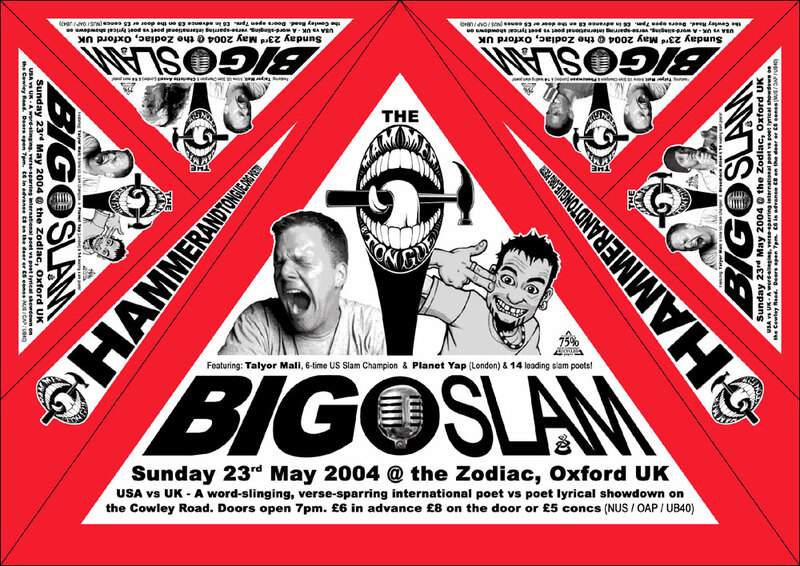 A design from 2004 for Oxford’s Slam poetry posse, Hammer and Tongue. This design was printed on A3 sheets and then guillotined to make a large triangular poster, 4 smaller triangular flyers and 2 long thin pointy bookmarks. The posters were hung on lamp-posts and other poles around town and looked a lot like road signs. The unusual triangular shapes were quite eye-catching and did lead some more creative folks to make hats, bikinis and even a cod-piece from them! The event was stunning. 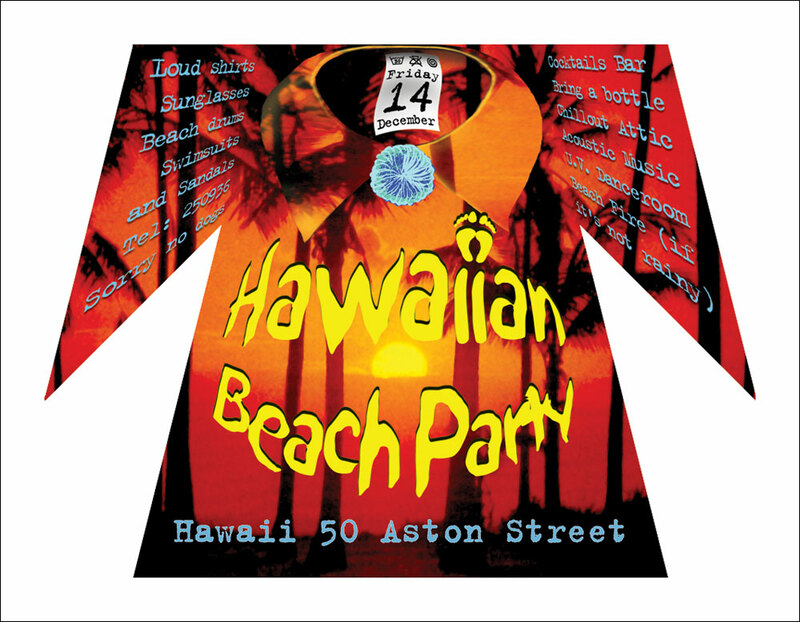 A small invitation for a strange party at Aston street from 2004. The shape neatly tesselates sideways which meant I did not waste much paper printing this, but it did take me several hours to cut the shapes out using a scalpel! 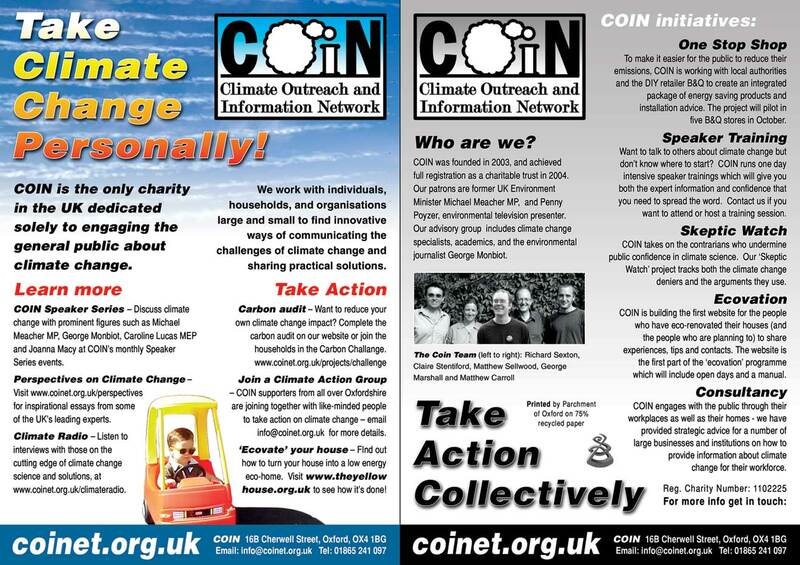 An early A5 flyer for COIN from 2004.